On a network notorious for its problematic coverage of transgender issues, Fox News' The O'Reilly Factor stands out as an especially egregious forum for transphobia, with host Bill O'Reilly using his perch to dispense bigoted and dangerous advice for parents raising transgender children. During the June 3 edition of The O'Reilly Factor, O'Reilly invited The Five co-host Kimberly Guilfoyle and Fox contributor Lisa Weihl to discuss six-year-old Ryland Whittington, whose parents Jeff and Hillary posted a YouTube video - now viewed nearly 5 million times - describing Ryland's discovery of his gender identity and their acceptance of his gender transition. O'REILLY: I always put myself in the shoes, I wouldn't do it. Would you do it? I wouldn't do it. O'REILLY: And you let the she be a boy? Would you do it? O'REILLY: We know you are touchy-feely. I don't think five-year-olds make those kinds of decisions. Ignore The Identity Of Your Transgender Child. O'Reilly clearly states that he'd be unwilling to acknowledge the requests of a transgender child to be identified in a way that corresponds with their preferred gender identity. In previous segments, O'Reilly has criticized parents who support and affirm their transgender children as being "dopey" and potentially engaging inchild abuse. Stop Your Child From Going Where He Or She Feels Comfortable. O'Reilly has also railed against efforts to allow transgender youth to access spaces and activities that they feel comfortable in. Want to join the Girl Scouts? Not if you're a "transvestite boy" who "thinks he's a girl." Wish to use a public restroom that matches your gender identity? That'd be like going into a Hooters without chicken wings - nothing short of "anarchy and madness." For O'Reilly, transgender kids should be denied access to the handful of spaces where they can feel safe and welcomed as they are. Force Your Child To Conform To Your Gender Expectations. O'Reilly has also encouraged parents to actively force their transgender children to conform to gender stereotypes. Transgender boys should be forced to wear dresses and do "girl things." Parents should continue addressing their transgender children with names the children don't identify with. Be cautious about letting children watch a show like Glee - it could turn them transgender. And if kids are engaging in gender-variant behavior, like a boy liking the color pink, punish them by sending them away to camp. This kind of terrible parenting advice affects real lives. Transgender youth already face astronomical levels of family rejection. Many of them flee their homes to avoid abuse and intolerance, contributing to high rates of transgender youth homelessness and incarceration. For those who stay, family rejection is linked to a host of negative health consequences, including higher rates of depression and suicide. Parents who refuse to acknowledge and affirm their transgender kids put them at risk for poor academic performance, substance abuse, and self-hatred. The mountain of evidence demonstrating the harm caused by unaccepting family environments is the reason so many professional medical organizations encourage parents to support and nurture, rather than try to change the behavior of, their transgender children. When O'Reilly doles out bad parenting advice to his audience, he's not just revealing himself to be uninformed and cruel; he's putting real transgender children, some of whose parents may be watching Fox News, at risk. 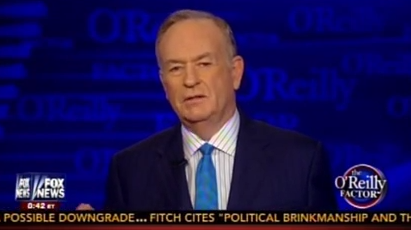 O'Reilly Doubles Down: CA Transgender Rights Law Is "Anarchy And Madness"